Skunk Works by Ben Rich. Ben Rich was the head of Lockheed Martin's "Skunk Works" division that developed this amazing airplane. The book reads like a Tom Clancy thriller, but it's non-fiction and all true. Deserves the incredible 4.8 average star rating on Amazon, everyone loves this book. When they were testing the car-sized wooden model of the initial stealth airplane design, the radar operator at first thought the model had fallen off the 12 foot pole it was mounted on. The radar was only 1500 feet away from the model. Then, the radar operator all of a sudden picked up the model. A crow had landed on top of the model and the radar saw the crow. When the bird flew off, the model of the aircraft was invisible again. The stealth design technology was so unexpectedly incredible, they had to spend half a million dollars designing a new stealth pole, because the radar would see the pole. If I remember correctly, the radar cross section of the final stealth fighter -- the first true stealth aircraft ever built -- was the equivalent of a marble, roughly the size of an eagle's eyeball. One of my favourites. My wife also loved it. 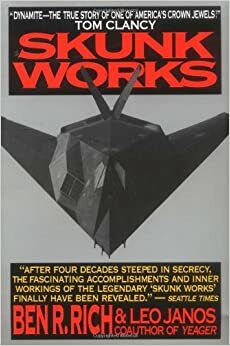 If you like the SR-71, and are interested in other Skunk Works projects like the U-2 and F-117, the book Skunk Works is a great read (and also a great audio book). A large part of why the original Skunk Works was so successful is because Kelly Johnson, and later Ben Rich, did not care about outward appearances. They had a job and they did it (and they made it profitable). Here's a great book on the subject. I have a copy of "Skunk Works" and it is indeed a great book. Amazon still has it for under $12. And seeing as it's quite popular, most large libraries should have a copy as well. It's great that you brought up "Sled Driver", I'm actually currently saving up to buy a copy. Brian Shul still has new copies available on his website for $250. I think the copies that go for very high prices on eBay are the first editions or some of the special commemorative versions. May I ask your opinion on the print quality of "Sled Driver"? I know Shul is a photographer, in addition to being a former SR-71 pilot, so I assume the photographic print quality is quite high. Have your read his companion book "The Untouchables"? There's nothing new in this - it has been done before. Want to build a Mach3 aircraft in the days when most people thought jets were pretty clever? Want to do it in <2years using materials that had never been used in a plane before - and do it on budget. And repeat the success with half a a dozen other projects. I just read an interesting book about Lockheed's skunkworks program. It covers a bit of WWII, Korea, Vietnam, but mostly the post-Vietnam era. I thoroughly enjoyed Masters of Doom. At the time, I recall a number of people who read the book bemoaning 1991 as a bygone era of opportunity, as if all the good ideas and opportunities to invent had been "used up". Interesting how different people take the same text as self-defeating vs inspiring. Also, on the topic of inspirational books, I always have to mention Skunk Works, one of my all-time favorites.